The Airport Pavement Structural Design System (APSDS) is the leading edge pavement design package for Airport Pavements. This page introduces some of our clients and details of how they have used APSDS on major pavement design and rehabilitation projects. Major aircraft manufacturers, Airbus Industrie and British Aerospace Airbus, used APSDS to design landing gear configurations for the new A380 large aircraft. Schiphol is the world’s fourth busiest International Airport. APSDS was used for the design of the new fifth runway. Total project cost is estimated to be €340 million. Construction commenced in early 2002 and was completed in February 2003. The project presented many challenges to the designers. Loading included all current wide-body aircraft and future New Large Aircraft. For further details on how APSDS was used for the pavement design, read Dr. Arian de Bondt’s article. For more general background on the project, see the Airport Technology article. Airbus Deutschland GmbH had to extend its premises at Hamburg-Finkenwerder for the production of the New Large Aircraft A380. The pavement was designed for the use of the A380 and service/maintenance vehicles. The structure of the existing Runway at Hamburg-Finkenwerder had to be evaluated because of the new A380 using this Runway. The design calculations were performed using APSDS taking into account the A380, a number of different single aisles aircrafts and smaller airplanes. To evaluate the existing pavement prior to reconstruction design calculations were neccessary, which were performed with APSDS. APSDS was used for the design of the rehabilitated pavement structure of taxiway C in Copenhagen Airport (among the largest in Europe with some 18 million passengers yearly). APSDS was used to evaluate the structural servicelife of the three runways and major taxiways at Copenhagen Airport, as it was assessed that other conventional design programs would not be able to form a satisfactory basis for the evaluation. APSDS was used for the design of runways (4.3 km), deicerplatform (7,000 m2) aprons (50,000 m2) at Billund Airport (the second largest airport in Denmark with some 2 million passengers yearly). Upgrading of parallel taxiway for current wide-body aircraft. Overlay with PMA on existing CRCP. Upgraded taxiway is operational since July 1997. 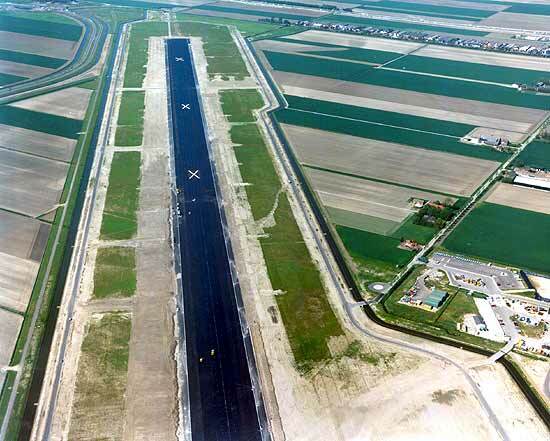 Rehabilitation of runway (3000 x 45 m) and associated taxiways. Loading included all current wide-body aircraft. PMA on existing asphalt structure. Execution in 1999-2000. Design for prebid documents for new pavements of runway, taxiways and apron. Loading included all current wide-body aircraft. Conventional asphalt on cement treated base. Construction planned in 2000. New runway (3000 x 45 m), taxiways and apron. Loading included civil and military aircraft. Construction in 1999-2000. Project cost for the new Ashdod North Port in Israel is about a billion dollars. Pavement alternatives studied with APSDS considered the lateral wander of the various vehicles and the frequency distribution of container weights. APSDS was used for a proposed industrial hardstand at a Port of Brisbane container terminal in Queensland. The study included asphalt surfaced and interlocking concrete block pavement alternatives. Some 11 axle load scenarios were used for the 3 vehicle types. The pavement designs included reductions in pavement thickness to allow for vehicle wander. HIPAVE (Heavy Industrial PAVEment design) is for the mechanistic analysis and design of flexible pavements subjected to the extremely heavy wheel loads associated with freight handling vehicles in industrial facilities, in particular, intermodal container terminals. It is designed to conveniently model each combination of vehicle model and container load and to combine the damage using the Cumulative Damage Factor concept. You are welcome to download and evaluate APSDS. There is only one version of APSDS - and it can be used in evaluation mode. Click here to download APSDS.